Custom USB Drives. Low prices and fast turnaround! 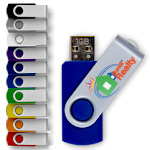 Now's the time to start planning for your fall and winter promotions, and nothing delivers a boost to your campaign than custom USB flash drives from MediaSupply.com. We offer the largest selection of custom USB flash drives, and we offer our most popular flash drives in our quick-turn rush service. You can complete your package with one of our many packaging solutions. We also offer the highest quality USB flash drive duplicators so you can load your data right from your office as you information is updated. Low Custom Flash Drive Prices! MediaSupply.com offers value priced PC-based and high speed standalone USB Flash Drive copiers from Nexcopy. PC based USB copiers offer the most versatility with drive security. Standalone USB duplicators offer faster speeds and simpler operation. They cost a bit more, but they prove their worth when a job needs to get done quickly. MediaSupply.com specializes in USB flash drive data loading and reloading. If you've found yourself with flash drives left over from a first release, MediaSupply.com can help you with putting new data on those devices. You can update your PDFs, software demos, flash presentations and powerpoints, and keep your USB investment working for you. MediaSupply.com offers all you need when using Customized USB Flash Drives and making your marketing project come to fruition. MediaSupply.com has more drive styles than anyone and we can offer a multitude of print options. We recommend that you focus on your company's or group's logo jumps off the device you chosen, whether it be for a marketing materials, financial reports, education packages, product catalogs or product PDFs. USB flash drives are easy to use, work fast, are functional on every type of device and offer custom print and data to fit your requirements. They not only deliver an impact when providing your customer with your data presentation, like financial reports, images, pictures, music and PDFS, but they keep on giving. Your customers and contacts will contintue to use the device after that initial presentation for storing their own data. Everytime they use your drive they'll see your companies logo. All our USB flash drive products include printing of your logo and information. MediaSupply's service staff will help you layout your design, set up your data for your device, and make sure your USB flash drive is exactly what you are looking for. If you're looking for the perfect way to complete your project, consider one of MediaSupply's USB drive packaging options. We can give you a packaging solution that will hold your inserts and pamphlets, and we can provide all the printing for you. You can complete your USB project by using one of our Nexcopy USB publishers, so you can load and reload you custom flash drives whenever you have updated data, music or pictures. These USB copiers are very affordable, and deliver versatility you can't find on any other USB publisher. Your digital storage project deserves the right choice with respect to design, print and packaging. USB flash drives make a smart and innovative gift that makes a great first impression and delivers a long shelf life to your marketing investment.